After a long discussion, it has been declared that Microsoft acquires LinkedIn for $26.2 Billion. The news was announced in Microsoft blog. Microsoft Corp. and LinkedIn Corporation on Monday have entered into a definitive agreement for $196 per share. Jeff Weiner will continue CEO of LinkedIn and he will be reporting to Satya Nadella, CEO of Microsoft. A press release was issued by Microsoft titled as "Microsoft to acquire LinkedIn" posted on June 13, 2016. Also CEO of Microsoft issued a memo to all LinkedIn employees. 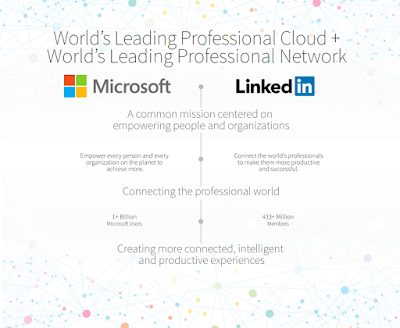 I'm excited to share that today Microsoft announced a deal to acquire LinkedIn. You can see how Jeff Weiner, the CEO of LinkedIn, and I envision the opportunity ahead in this public presentation. This deal brings together the world's leading professional cloud with the world's leading professional network. I have been learning about LinkedIn for some time while also reflecting on how networks can truly differentiate cloud services. It's clear to me that the LinkedIn team has grown a fantastic business and an impressive network of more than 433 million professionals. The answer to all of those questions with LinkedIn is squarely yes. We are in pursuit of a common mission centered on empowering people and organizations. Along with the new growth in our Office 365 commercial and Dynamics businesses this deal is key to our bold ambition to reinvent productivity and business processes. Think about it: How people find jobs, build skills, sell, market and get work done and ultimately find success requires a connected professional world. It requires a vibrant network that brings together a professional's information in LinkedIn's public network with the information in Office 365 and Dynamics. This combination will make it possible for new experiences such as a LinkedIn newsfeed that serves up articles based on the project you are working on and Office suggesting an expert to connect with via LinkedIn to help with a task you're trying to complete. As these experiences get more intelligent and delightful, the LinkedIn and Office 365 engagement will grow. And in turn, new opportunities will be created for monetization through individual and organization subscriptions and targeted advertising. Jeff and I both believe we have a significant opportunity to accelerate LinkedIn's growth and the value it brings to its members with Microsoft's assets and scale. In fact, when Reid Hoffman, the founder of LinkedIn, and I spoke about the opportunity for us to come together, he called it a "re-founding" moment for LinkedIn and an opportunity to reach the mission the company set out on 13 years ago. The opportunity for Office 365 and Dynamics is just as profound. Over the past decade we have moved Office from a set of productivity tools to a cloud service across any platform and device. This deal is the next step forward for Office 365 and Dynamics as they connect to the world's largest and most valuable professional network. In essence, we can reinvent ways to make professionals more productive while at the same time reinventing selling, marketing and talent management business processes. I can't wait to see what our teams dream up when we can begin working together once the deal closes, which we expect will happen this calendar year. A big part of this deal is accelerating LinkedIn's growth. To that end, LinkedIn will retain its distinct brand and independence, as well as their culture which is very much aligned with ours. Jeff will continue to be CEO of LinkedIn, he'll report to me and join our senior leadership team. In essence, what I've asked Jeff to do is manage LinkedIn with key performance metrics that accrue to our overall success. He'll decide from there what makes sense to integrate and what does not. We know that near term there will be no changes in who reports to whom so no reporting relationships at Microsoft will change in that regard. This approach is designed to keep the LinkedIn team focused on driving results while simultaneously partnering on product integration plans with the Office 365 and Dynamics teams. During the integration, we'll pick key projects where we can go deep together that will ultimately result in new experiences for customers. Kurt DelBene will lead the overall integration efforts at Microsoft in close partnership with Qi Lu and Scott Guthrie. I'm on the LinkedIn campus today in California and will host a call for investors at 8:45 a.m. PT with Jeff, Brad and Amy - please join if you can. Following that, I'll then spend the day meeting with the LinkedIn team. Tomorrow, I'll host a special Microsoft employee Q&A - I hope you can make it. So far, what I've learned about the LinkedIn team is how much our cultures share many of the same attributes. We both care deeply about individual and collective growth, and find deep meaning in the work we do to make a difference in our world. Together we'll do just that. While I'm in northern California sharing our vision to empower professionals, the Xbox team is in southern California at E3 sharing our vision to empower gamers. I encourage you to check out the E3 press briefing, which starts at 9:30 a.m. Pacific Time. Finally, if you're not on LinkedIn, join up now and start using and learning more. 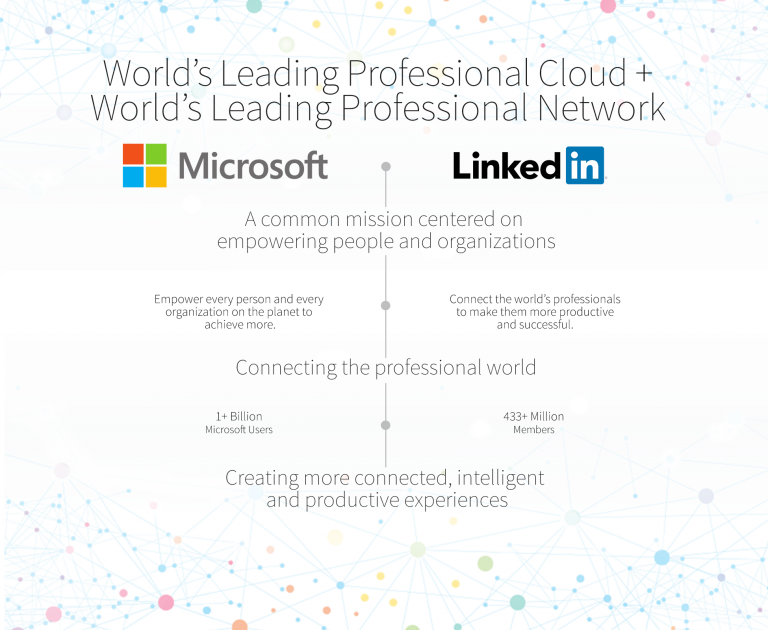 LinkedIn has a huge network of professionals and Microsoft has professional cloud. Both companies will be benefited with this synergy. Microsoft will be leveraging the network of professionals in LinkedIn and make sure business and professional conversations will routed to Skype. 1. How much the common shareholder financially benefit from the LinkedIn acquisition? A. The acquisition was $196 per share hence common shareholders are going to walk away with that. The acquisition is expected to be close in this calendar year. 2. 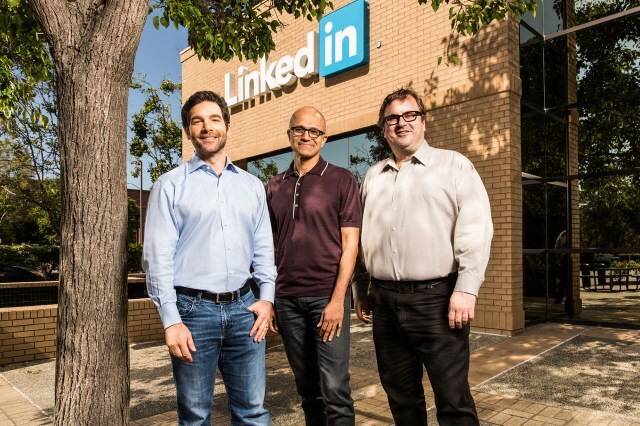 What are the Major Reasons for Microsoft to acquire LinkedIn? A1. One main reason is to promote earlier acquired product Skype, Office360, incorporation to Microsoft CRM software, Dynamic. A2. To acquire as much data of professional people or I would say data of 400 million registered users. 3. Why LinkedIn was ready to get acquired? A. The New York Times article titled "One Unspoken Reason Behind the Microsoft-LinkedIn Deal" suggest that over reliance on stock based compensation plummeted the share price significantly.